Belleek sculpture of the Blessed Virgin Mary is made of fine Irish china. The Belleek Blessed Virgin Mary figurine features embossed detailing. 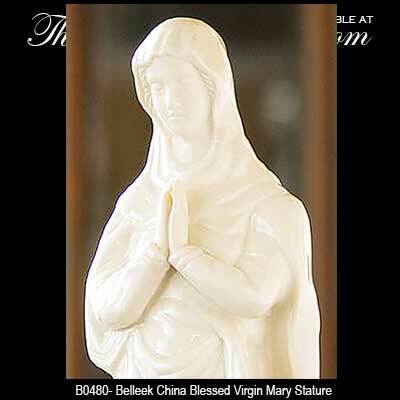 The Belleek Blessed Virgin Mary statue is composed in quiet prayer. The Belleek Virgin Mary figurine measures 3 1/2" wide x 12 1/4" tall; she is hand crafted in Belleek, Ireland and received gift boxed.